This is last week's news, but it's not often that someone gets written up in the New York Times after getting passed over for a job. It's even less often when the person being written about was a classmate and casual acquaintance of mine from college. But this is the case for Kim Ng, who recently came in a "close second" for the job of general manager of the Los Angeles Dodgers. Had she been hired, she would have been the first-ever female, and first ever Asian-American, general manager of a major league baseball team. But, given how highly regarded she appears to be in the baseball world, I suspect she will achieve both of these firsts before much longer. LOS ANGELES, Nov. 16 - As the Los Angeles Dodgers introduced their new general manager Tuesday, the most intriguing candidate sat in the audience. Kim Ng pulled up a chair in the front row. She wore a tailored black suit. She clapped at all the right moments. This was the rare occasion in which the person who did not get the job received nearly as much attention as the person who did. "Of course I'm disappointed," Ng said. "But I think it is groundbreaking that a woman even interviewed. The game is progressing. Next time, it may turn out different." Although Ng's gender and ethnicity can make her seem like an untraditional candidate, her baseball roots are old-fashioned. Ng grew up in Queens playing stickball in her driveway. She rooted for the Yankees and once said that she made a scrapbook of Thurman Munson obituaries the day after he died. A star softball player in high school and college, Ng was all set to become a consultant or an investment banker after college. But when one of her coaches at the University of Chicago told her about an internship with the Chicago White Sox, Ng saw a way to combine her passions. The White Sox, then as now, fashioned themselves a progressive organization and gave Ng her first job. "I've never been around somebody who would ask so many intelligent questions," said Dan Evans, then an assistant general manager for the White Sox. "Kim always wanted to know why things were done a certain way." While many of baseball's new-age general managers are portrayed as coddled Ivy Leaguers inextricably linked to their laptops, Ng nearly quit baseball after four years with the Yankees. She might have thought about leaving again in 2003, when Bill Singer, then a Mets scout, taunted her with an exaggerated Chinese accent at the general managers meetings. The way Ng handled the incident, and the way she came back from it, only enhanced her profile. Charles Kuffner at Off the Kuff has also written about Kim Ng recently, here and here. And here is an interview with her (undated, but obviously fairly recent, since she is with the Dodgers) from Women's Sport Foundation. I did not know Kim well. In college, she was, literally, the friend of a friend. But it is still a trip to find someone you knew once-upon-a-time but had pretty much completely forgotten over the years, "suddenly" in the news (for positive reasons). I wish her the best of luck in blazing new paths for women in this particular male-dominated workplace. Congratulations to the White Sox! Chicago finally has a baseball champion. Gives me hope that maybe even the Cubs can do this someday. Watching the games this post-season has reminded me how much I enjoy baseball, even after five years of barely paying attention (except for a brief, painful span two Octobers ago). I think I'm going to have to go to a game or two next year for the first time in ages. And the logical place, that park down the road in Houston, looks like a very enjoyable place to watch a game. Alas, it's the White Sox and not the Cubs, but I'll take what I can get. Chicago baseball fans cannot be picky. I grew up in Chicago going to Cubs games at Wrigley Field, starting back in the days of Rick Reuschel, Larry Biitner, Ivan DeJesus, and Bobby Murcer (that would be 1977 for those who may not have been paying attention). At the time it had only been 18 years since Chicago's last World Series. Of course, for the Cubs it had been 32 years even back then, but who's counting. So for the first time since 1999, I will be watching the World Series this year. The one good thing about it being the White Sox and not the Cubs is that if they don't pull it out, I won't be devastated. (I can't take any more 1984 or 2003 NLCSs!) Especially since a couple of my favorite players, Craig Biggio and Jeff Bagwell, are on the other side. I've always like the Astros, and especially those two, ever since I lived briefly in Houston in the early 1990s. In fact the last big league game I've attended was the final game at the Astrodome, back in 1999 when the Braves eliminated the Astros in game 4 of the division series. Next year, it may finally be time for me to head back to Houston for another game. Of course, given the dramatic success of the Astros this year, I suspect it may not be so easy to get tickets on the spur of the moment as it was back then. 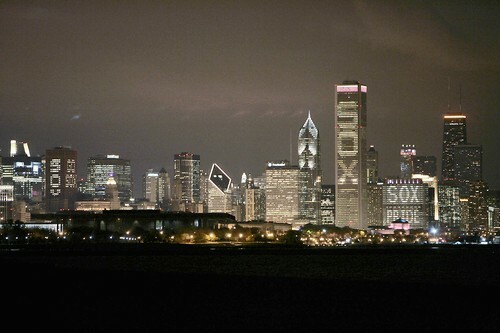 Meanwhile, though, go White Sox! Chicago deserves a baseball champion again. Congratulations to one of my all-time favorite baseball players. Ryne Sandberg, the slick-fielding second baseman who holds the all-time record for homers at the position, was elected Tuesday to the Baseball Hall of Fame, making the cutoff by just six votes. In his third year on the ballot, Sandberg was picked by 393 voters. He appeared on 76.2 percent of ballots, just above the 75 percent cutoff (387). Sandberg received 49.2 percent of votes in 2003 and got 61.1 percent last year, falling 71 votes short. "There's been some tremendous, tremendous players who waited longer than I had to wait to get into the Hall of Fame," Sandberg said. "I think defense had everything to do with me getting into the Hall of Fame." Third baseman Wade Boggs was the only other player elected. Boggs, a five-time American League batting champion for the Boston Red Sox, was selected by 474 of the record 516 voters who are 10-year members of the Baseball Writers' Association of America. My interest in baseball has dropped precipitously in the last five years. But once upon a time (and likely, once again sometime in the future) I was a huge fan. I grew up on the Chicago Cubs in the late 1970s and 1980s. The 1984 and 1989 seasons, the Cubs' first division titles and playoff appearances since the 1940s, and Sandberg's prodigious contributions to them, will live forever in my memory.